Maltodextrin has been getting a ton of heat over the past couple years. But what is it? Why is it even used? And what’s up with all the controversy? We answer all the top questions with unbiased, honest ingredient information and expert food science insights. Maltodextrin is a food ingredient made from starch. It is used as a flavor carrier and to improve thickness, texture, body, and taste of food products. 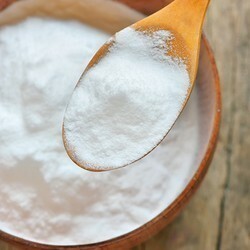 It is a flavorless, relatively nonsweet, non-sticky, white powder. Maltodextrin is a polymer that consists of multiple units of glucose linked together in a linear fashion. Maltodextrin is commercially made starting with a simple starch and using the hydrolysis process*. *Hydrolysis Process: a type of in vitro digestion, that shortens long-chain lengths and makes little starches, so they can be soluble and clear in a solution, but leaving chain lengths long enough that they do not develop the sweetness of sugar. Some common products include: candy, chocolate, puddings, seasoning blends, pie fillings, weight training supplements, beer, bottled and canned beverages, low calorie foods, prepackaged chips, soups. Since maltodextrin is uniquely functional and does not carry significant sweetness, it is not self-limiting to a formula and therefore used in all food and beverage segments. Functionality – maltodextrin helps a product become more usable. The health and nutraceutical industry especially relies on maltodextrin because it is 100% easily digestible carbohydrate used in adult nutrition and sports nutrition products. Athletes use maltodextrin because for them it is “pure energy”. Adults with dysphagia use maltodextrin because it is easy to consume. United States: Commonly obtained from corn. Europe: Commonly obtained from wheat. WHAT FORMS IS MALTODEXTRIN AVAILABLE IN? **Meaning immediate solubility. e.g. Some protein powder manufacturers use agglomerated maltodextrin so the product can immediately disburse in water, with little stirring required. Yes, the FDA states that maltodextrin is a safe food additive with GRAS status (Generally Recognized As Safe). 100% digestible, usable fuel for the body — nothing more than a chain of repeating glucose molecules. Allergen Status: Wheat-derived maltodextrin may contain traces of gluten, therefore individuals with gluten-intolerances may suffer from side effects of this food additive. However, since most food labels only list “Maltodextrin” and not “Potato Maltodextrin“, it is difficult to determine the source of maltodextrin on food labels if it is obtained through sources other than wheat. WHY IS MALTODEXTRIN BEING TAKEN OUT OF PRODUCTS? Controversy over genetically modified organisms has remained a hot topic in the food industry throughout the past couple decades. Corn maltodextrin has received a lot of attention with its strong association to GMO’s (about 80% of US corn is genetically-modified). Nevertheless, maltodextrin is available in a non-GMO verified format. The origin of the name “maltodextrin” has become an industry urban legend. Some controversy exists simply because the letter “x” in maltodextrin makes it sound a synthetic and chemical. And lastly, a controversy has started on the internet about maltodextrin causing a spike in blood sugar. But maltodextrin is seldom used by itself as a food, but rather as an ingredient in a food, thus this isn’t a serious concern. Most maltodextrin has a DE (dextrose equivalent) of 10 and only about 3% sugar left over after processing, which isn’t much compared to a something like apple juice (24 grams of sugar in 8 oz. apple juice). IS THERE AN ALTERNATIVE TO MALTODEXTRIN? No, there is no immediate replacement to maltodextrin. HOW IS THE INDUSTRY ADDRESSING THIS? Snack food companies and dry flavor & seasoning manufacturers are doing tons of work, but there is no current replacement. Some companies are experimenting with gum arabic (is a natural gum consisting of the hardened sap of various species of the acacia tree) as a flavor carrier to help spread out and disperse high impact flavors. However, gum arabic is not looked at as a simple alternative because of: price, supply chain challenges, and since it’s a common emulsifying agent it has different functionality properties. Click here to learn how you can obtain the Go Clean Label™ seal for your food and beverage package use.